Say Happy Birthday to someone you love with this spectacular big White Happy Birthday Car Bow ribbon and make their day. This Happy Birthday Car Bow is White, but you can find other colors in the store. If someone’s birthday is coming up and you’re planning a really special gift for them, make sure you present it properly with this stunning White Happy Birthday JumBow Car Bow. 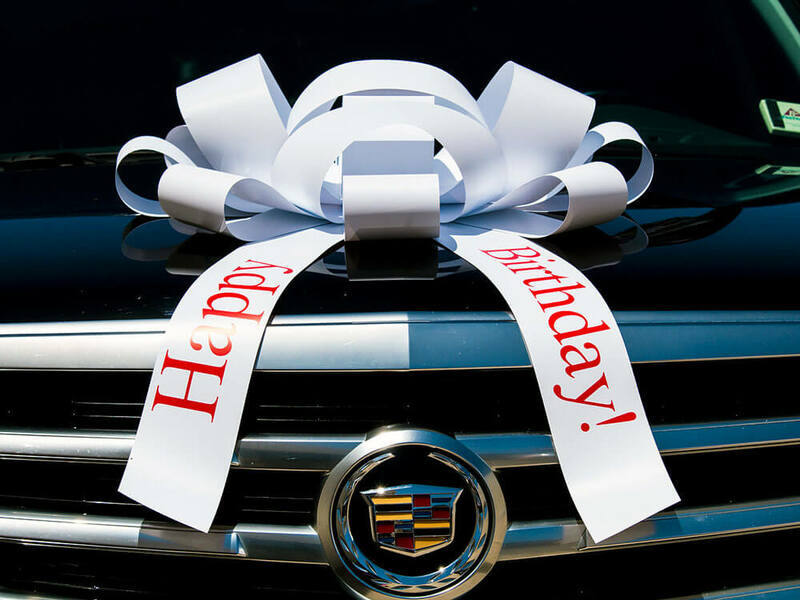 Present your special birthday gift in style with the White Happy Birthday Car Bow. The Happy Birthday Car Bow is also available in Pink and White, and we also sell a wide range of other car bows with different messages. See our Graduation Car Bow, Happy Holidays Car Bow, Surprise Car Bow, and Big Red Car Bow. We even provide Customized Car Bows for your own unique message. You will never have to wait long for your car bows because we pack them off as soon as you have placed your order. With upgraded shipping options available we can deliver to any USA address in between 1 and 5 days.